Well, for Facebook you can privately collect your dislikes with a Firefox add-on or post some "negative" comments to express yourself. But you shouldn't! You are supposed to promote good karma in a social network and Facebook wants to generate revenue with positive company pages. Unlike in social communities, in the context of a Choosle you should consider negative arguments. A decision base on only the good factors can hardly be sound and objective. The "bad" arguments also carry information. They, at least, reveal, that you have not ignored or simply forgotten them. Some option might have negative consequences, even if it wins with many pro-arguments. For example a high price for a product might be a bad argument, but you still need to be aware of it, when making your decision. Probably that high-price option has a lot of advantages and will win over the others otherwise. While in open communities negative ratings or down voting could become personal and might likely to be misused, the ratings in a Choosle should have a very small, if any, connection to the author of the argument. It's not about any reputation of the participants (well, it never is ;), it's about comparing the options with each other. Also, Choosles will most likely to be shared within smaller, closed groups. Public Choosles are mostly read-only, providing for example/template copies and suggestions. There should be no need for a prove of seriousness or a system to discourage negative ratings (The Value of Downvoting, or, How Hacker News Gets It Wrong). In a all-positive world, go/no-go decisions would also be difficult to interpret with all the pros and cons for the one option rated more or less positive. You have to decide on the score being above or below a certain medium value. Also the visual impression would be wrong, if the cons appear positive (maybe less positive, but still positive). Technically, it is only a definition of the rating value range. 0..20 is as good as -10..10. We simply define 10 for neutral in the first range and 0 in the latter. Or with a 5-star rating element, only empty stars must be bad, 5 full stars are good and 2.5 stars mark the neutral rating. Visually it probably shows more something like empty stars for "no opinion" to full stars for "I like it very much". Interpreting the range values is cumbersome. You need to think about it with every rating of every argument. 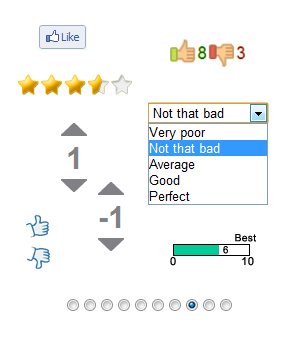 So if we want to rate negatively, the number values should also represent that intention directly. Most often you have some kind of natural bias within a topic of interest. Maybe it's a budget you have in mind, some expectations about how something should be or an average of experiences. This bias marks the neutral value 0, no visible slider bar or 2.5 stars. In a shared decision you might also want to signal your disapproval of the average rating from others by compensating their values with a negative one. In Choosle we already have +/- sliders to color the text of an argument in green for positive and red for negative. The planned 5 star rating control (see the previous post) could be presented with green stars for positive and red stars for negative (maybe via right-click). We rate or judge all kind of things. Products, services, thoughts, statements, accomplishments or even people. "She is a perfect 10! ", "You have got an A+! ", "I like this idea best. ", "That is the best deal you have ever made!",... . Rating helps us to compare things within a certain context. Sometimes we define this context ourselves ("she is a 10", so she is the best looking girl I can think of) or it is given by the situation or the environment. To give a rating a comparable meaning, a range of values must be defined. Mostly this range is connected with the context and again we can (re)define it ourselves (wow, i have just met a 12!) or it is given by the environment. With some ratings we also need some reference rules for the range values. Most schools in Switzerland for example define a grad 6 as the best, a grad 1 the worst and a 4 as passed. 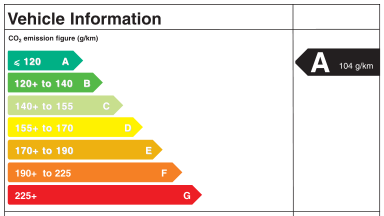 In Germany it is the other way round, a 1 is best, a 5 worst and also a 4 has passed. Other countries bring in letters A..F and +/-... I hope you get the point. In Choosle you will find simple 5-star controls for a quick roughly rating and a green/red slider for a more fine grained input. In the backend data model both controls produce values in the range of -100..100. So they can be switched at any time.